Adolescent Acne is characterized by chronic inflammation of the skin. The first signs of acne are usually seen during puberty (ages 11 or 12, with cessation at 18 or 20). When there is an increase in hormone production, the sebaceous glands are stimulated to produce excessive amounts of sebum (oil). Acne begins when a hair follicle produces cells that stick together so tightly that they cannot be shed. These cells mix with other skin materials, such as pigment and bacteria which stick together and form a plug. This plug is called a comedone (blackhead). The sebaceous gland continues to produce sebum (oil). Frequently the follicle bursts or leaks, forming a papule or pimple. As the follicle releases its contents into the surrounding tissue, inflammation occurs and the area surrounding the pimple becomes red and swollen. White blood cells enter the tissue, causing it to liquefy, forming pus. It is not known why some people develop acne while others do not. Acne affects an adolescent’s self esteem, and if left neglected, can cause permanent scars and pits. The Skin Studio Determines the grade of acne on a grading system of 1-4 and the type of lesions - in order to accurately develop its treatments, educate the client, and plan a home program. By reexamining our client population the assumption that acne mainly affects mostly adolescent males has been challenged. Studies have shown that in the 1990s, the incident of acne increased in adult women well into their 20s, 30s and even 40s. The majority of the Skin Studio’s client population are females over age 20, 90% suffer from mild to severe acne. Hormonal changes, pregnancy, oral contraceptives, and family history are among the many aggravating factors, which influence the development of acne. Studies have shown that stress is the most common aggravating cause in 75% of adult women. Increases in hormone levels caused by chronic stress subsequently lead to an increase in inflammatory nodules. 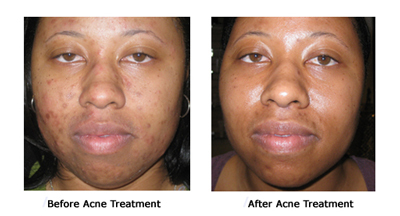 Picking the acne lesions seems to increase when under stress, increasing the spread of bacterial infections. Cosmetics are less problematic today as more noncomedogenic products are now available. However, certain hair sprays, conditioners and moisturizers contain ingredients that may cause problems to acne suffers. Acne therapy usually involves ice compresses to decrease inflammation, Alpha and Beta - hydroxy acids, enzymes and vitamin A. These products kill bacteria, and are also follicular irritant sloughing out the impacted cells from the pores. 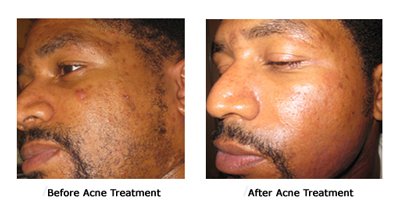 We also address hyperpigmentation related to acne scarring. Our clients dietary habits are also assessed. Facials are required along with compliance of a home program and a commitment to follow instructions.With this we have been quite successful in controlling acne problems.